Symptoms of pronator teres syndrome can be very similar to carpal tunnel syndrome and include tingling or numbness in the palm, thumb and three fingers but not the little pinky finger. There will be an aching sensation in the forearm and tenderness when feeling or pressing in on the pronator teres muscle in the arm. Strength will be decreased in the thumb and first three fingers as well as when turning the forearm in and bending the wrist. Specific tests a doctor or therapist would do to help diagnosis pronator teres syndrome would be to try and resist pronation of the forearm and flexion or bending of the wrist. If the pain is reproduced then this may indicate pronator teres syndrome. It is important to distinguish between pronator teres syndrome and carpal tunnel syndrome. With carpal tunnel syndrome, there will be no weakness or pain with turning the palm down (pronation) and the Pronator Teres muscle is not tender to touch. Cases of carpal tunnel syndrome also do not cause neural symptoms such as numbness or tingling in the palm of the hand. In CTS this is isolated to the actual thumb and fingers. Pronator syndrome usually occurs after prolonged or repetitive forearm pronation (turning the palm of the hand to face downwards), accompanied by forced flexion of the fingers. In simple terms, forceful grasping with the hand and twisting at the wrist. These kind of movements are common in manual occupations such as carpentry and mechanics. In sports, racket sports, rowing, and weightlifting are the most common culprits. The reasons this causes compression is due to an increase in muscle bulk of the pronator teres muscle. 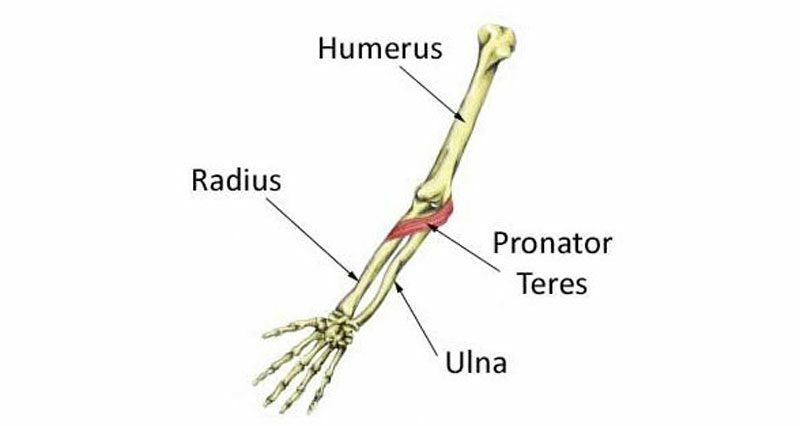 Pronator Teres Syndrome may also occur as a result of a trauma to the forearm, bony abnormalities, tumors or restrictive bands of fibrous tissue and scar tissue. Interestingly, it is four times more common in females than males! Rest from activities which may be contributing to the condition. Apply ice to ease pain and swelling. Cold therapy or ice can be applied for 10 to 15 minutes every hour initially reducing to 3 or 4 times a day as required. A doctor may prescribe painkillers or anti-inflammatory medications such as ibuprofen. A sports injury specialist may use electrotherapy treatments such as ultrasound or laser. Sports massage may be helpful to reduce muscular tension. Pronator muscle stretches may be helpful. Acupuncture may be effective in releasing muscular tension. A nerve block or corticosteroid injection may be used if symptoms do not improve. Surgery is very occasionally used to release tight or abnormal structures. This article has been written with reference to the bibliography.